Elvis Presley is one of the most known rock and roll star in America. Fans of the king of rock can continue enjoying his entertainment by playing Elvis A little More Action slot machine. This rock and roll star has been memorized in many other ways but having a slot based on him is quite unique. This IGT production is based on a hit in 1968 called “A little less conversation”. 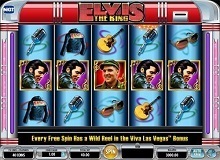 The scene of this slot is set in Vegas due to Elvis close Association to the city. Behind the 5 reels is a big palm tree. This video slot game comes with 50 paylines, scatter symbol, multipliers, Free Spins Round and a wild multiplier. Playing Elvis A Little More Action for real money offers the gamers with a fantastic gaming experience. The 50 paylines featured in this slot are not fixed. Once you have chosen the number of lines to bet on and the coins to bet per spin, press the spin button and start the gameplay. The betting amounts range from $0.01 to $5 per line. One can, therefore, bet with as much as $250 per spin. This betting range incorporates both players with low and wide betting budgets. The slot is equipped with an autoplay option which allows gamers to choose their desired number of times they want to spin automatically. The jackpot prize one should expect in the gameplay is $50,000. 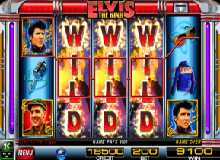 There are several combinations that will earn you a payout in Elvis A Little More Action slot. A winning combination is formed by landing three or more icons of a kind on a paying line. Payouts will increase when one gets more than three icons in a row. The huge payouts in this slot are accompanied by heaps of fireworks and cheering. The design and the soundtrack in Elvis A Little More Action are incredible. You will have a feel of the King of Rock and Roll songs since they will play at the background throughout the gameplay. The graphics used are also vibrant and bright which evokes an exact image of the 1960s. It comes with an RTP of 94.97%. Wild Symbol – The wild icon is represented by Elvis neon sign. This symbol does not only act as the wild, but it has the highest pay. The wild replaces the non-bonus icons on the reels thus forming several winning combinations. It can also appear stacked on the reels thus increasing the chances to win for the player. Two or three of the wild symbols on adjacent reels awards the player 50 and 250 coins respectively. A full house of these symbols pays a maximum payout of 1000 coins. 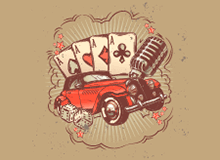 Scatter Icon – The scatter symbol of the casino online game is the rockstar with a gold disk. It will only appear on the 2nd, 3rd and 4th reel. Three Presley smiling icons award the player x2 multiplier and trigger the bonus feature. Free SpinsThis bonus round will be unlocked when the gamer lands at least three Presley with a disk icon on the reels. The player is awarded 5 to 15 free spins. One is able to re-trigger the free spins feature to 255 spins. Stacked WildsThis is an awesome feature which makes it worth to play Elvis A Little More Action Casino Slot online. It gives players a huge winning potential. Wild icons will appear on top of other icons on the reels which increases the gamer’s chances of hitting several winning combinations. This slot will be fun to play irrespective of whether you love rock’n’roll music or not. 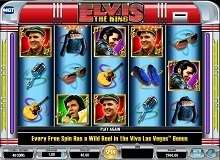 You can also play free Elvis A Little More Action at casinos online and enjoy the engaging and smooth gameplay. Stacked symbols feature keeps the player’s interest high since they can hit several wins simultaneously. It is a perfect choice for anyone looking for a slot with innovative gameplay, generous rewards, and a fun theme.